The flower garden truly is a thing of beauty. Like many people I always wanted my very own. I didn’t know where to start, what to grow, or even how. But once I got the basics down I realized that it doesn’t have to be very hard. It can actually be very easy to grow your very first flower garden with the right knowledge. Were going to take a quick tour of the basics of flower gardening. If you can master these things then you too can grow a stunning flower garden. There are three different types of flowers. Annuals, Perennials, and Biennials. The main two were going to look at is Annuals and Perennials. 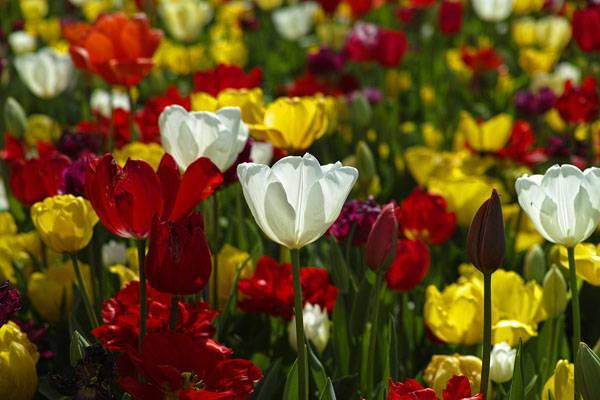 Annuals: These flowers are grown from seed each year and then they bloom. Once their season is over then it is over. You have to replant these each year from seed again. Perennials: This type usually has some root or a dormant period where they can continue to survive until there next season. So these types of flowers don’t really die. Both of these are suitable for the beginner gardener. Some do find perennials to be a little more work, but usually their not that much more work. Actually, Perennials do very well in environments where the weather is cold in the winter. You should try to mix up your flower garden with both of these types. There are flowers of both types that are easy to grow for someone new to flower gardening. Weather you like it or not your going to need some fertilizer or compost. Even a garden with good soil should still have fertilizer added to it. There are allot of different types, but the best type of fertilizer is always manure. Yes it does smell, but it is the most natural form of soil enhancement there is. You just cant beet it. Not any manure will do. Picking the right manure for the right plants can help the growth of your flowers a great deal. For example, cow manure doesn’t heat the same way other types do. This makes cow manure good for flowers that don’t like the hot manures. It helps to find out what your plants like better. You are not just limited to manure. You can get more commercial types of fertilizer if you wish. These fertilizers can be used in conjunction with manure. Just realize that these fertilizers are not really a good substitute for manure. All of your plants will require different amounts of water. You need to be aware of the plants that need to be watered regularly. For example, most types of roses will need to have plenty of water. At the same time some flowers will not require that much water. In fact you may even harm some flowers by over watering them. Your location will matter too. If you have a well made flower bed out in the open your flowers may get enough water from the rain. If you live in a dry climate they wont get enough, and if they are in a sheltered area they wont get very much rain water either. The soil can make a difference in how often you must water. Sandy soil will need to be water frequently because it dries out fast. A final tip you should know watering your plants deeply is ideal. Simply sprinkling water over them will not always be good enough to get to the roots. Each flower you choose to grow will have its own ideal growing conditions. The idea is to put it into those ideal conditions the best you can. Some flowers will grow better in certain soil, under certain weather conditions, require different amounts of water, need more space apart, and so forth. Learn about the flowers that you would like to grow so that you can give them their best chance of survival.